During his years in power, Turkish President Recep Tayyip Erdogan has changed the core principles of Ankara's domestic and foreign policy. Dreaming of being the leader of the Arab world, Erdogan has long supported Islamist movements in the Middle East. Recep Tayyip Erdogan has continuously been in power in Turkey since 2002. He has won elections six times as president and prime minister. Since the death of Kemal Ataturk, Erdogan is of course the most notable Turkish politician. The legacy of Ataturk has played an important role in building the modern Turkish state. He built a strong country respected by the Sunni majority as well as the Kurdish and Alevi minorities. In foreign affairs, Turkey was neutral toward the Arab world. But Erdogan’s policy is totally different, French journalist and author Renaud Girard wrote in an article for Le Figaro. In domestic affairs, Erdogan has been building an authoritarian presidency. Many analysts underscore that in recent years under Erdogan’s rule Turkey is drifting toward an autocracy from a parliamentarian republic. Finally, his craving for power forced Ahmet Davutoglu, one of Erdogan’s closest allies, resign as Prime Minister. "But what is even worse is that Erdogan ruined the principle of nationwide consensus and yielded to the dangerous temptations of nationalism," the author wrote. Erdogan’s new policy resulted in the termination of a 2013 ceasefire deal with Kurds. As for foreign affairs, Erdogan is acting like a "new Sultan of the Sunni world," the article read. Ideologically, Erdogan is a supporter of the Sunni Muslim organization Muslim Brotherhood. This means that the Turkish president should believe in the concepts of national sovereignty and political activism. But actually Erdogan believes that no secular law can be superior to Sharia rules. "Erdogan is obsessed with the idea of reviving the Ottoman Empire. His dream is to have Turkey as the leader of the Muslim world," Girard wrote. This dream has affected Turkey’s foreign policy. Between 2002 and 2010, Turkey had normal relations with its neighbors. Ankara had good ties with Syria, Russia and Iran. 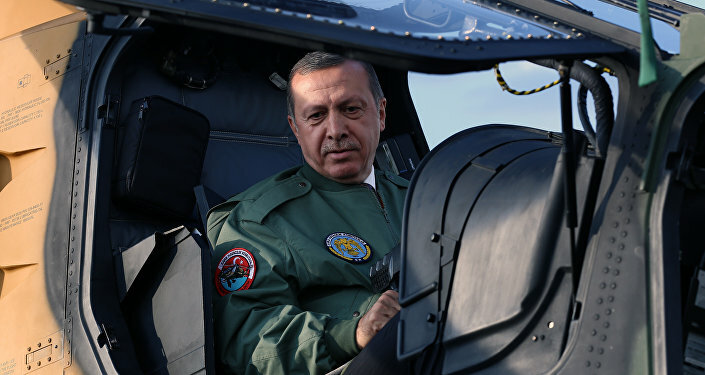 However, the Arab Spring prompted Erdogan to political adventurism. He began supporting Islamists in countries like Egypt, Tunisia, Libya and Syria. "But this policy has failed. In none of those countries have Islamists managed to come to power," the author wrote. The EU should keep a cool head in bargaining with Ankara over the migrant crisis. "Why is Europe making concessions to Erdogan who is running suicidal domestic and foreign political courses? Taking into account the crisis in the Turkish economy, sultan Erdogan needs Europe more than Europe needs Turkey," the journalist concluded.